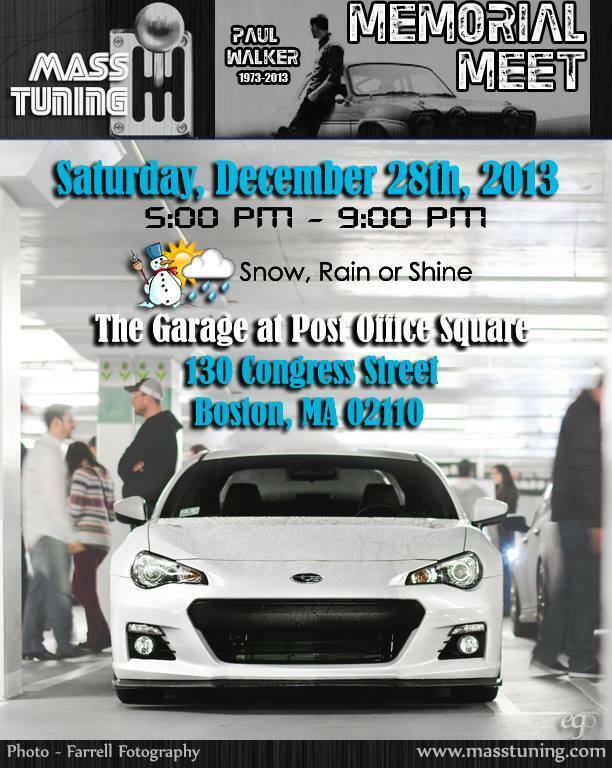 In memory of Paul Walker (Brian O'Conner), MT will be dedicating this event for fellow enthusiasts. Join us as we honor his life, passion and impact he has made on our community. All cars welcome! Floors 4, 5 & 6 (lowest levels) will be reserved, consisting of 700+ parking spots. Spectators who prefer not to show their cars can park on floors 1-2. The weekend garage rate is $9/car and includes downtown parking until 5am. Admission into MT reserved floors is $10/car and spaces are first come first serve. Donations for Paul's Reach Out Worldwide charity will be greatly appreciated. 100% of the proceeds from MT merchandise, along with any other donations, will be given to the foundation. Please also bring cans of food as they will also be donated to The Greater Boston Food Bank! Please keep cars and music turned off when parked. Smoking, burnouts and excessive revving are strictly prohibited. Boston Police detail officers will be on-site. Prospective Vendors: Email [email protected] for details!